10 years of Woolly Wormhead! I can’t quite believe that Woolly has been publishing for 10 years; that’s a very impressive time span! I’ve got huge respect for Woolly on multiple levels; both as a friend and as a designer. We first met many years ago in Sterling, Scotland. We were teaching at an event for a week and as it was a rather depressing affair we cheered ourselves up nightly :-) It did mean that we cemented our friendship very firmly. As a friend Woolly is upfront and generous. She always has time to help and support. When I’ve got personal or business issues I need to work out she’s one of the first places I’ll look for advice. As a designer Woolly is very unique and focused. She only designs hat. At first I wondered why that was but after knowing her for a while and talking about it this makes sense. They’re not hats, they’re sculptures for the head. She has trained in several areas (engineering, sculpture and teaching) but creatively sculpture is where her focus is. Each hat is a well engineered sculpture. The teaching side comes through very clearly in the pattern writing as well. All patterns (where necessary) are both written and charted. In addition to this any unusual technique has got a full tutorial in the pattern; again with both written and illustrated directions. To celebrate Woolly’s design talents it made sense to me that I’d knit through one of her patterns. We both share a love of side-to-side hats so I opted to knit Marina. Ideally a striped yarn would have been great but I used what I had to hand (Navia Traditional). 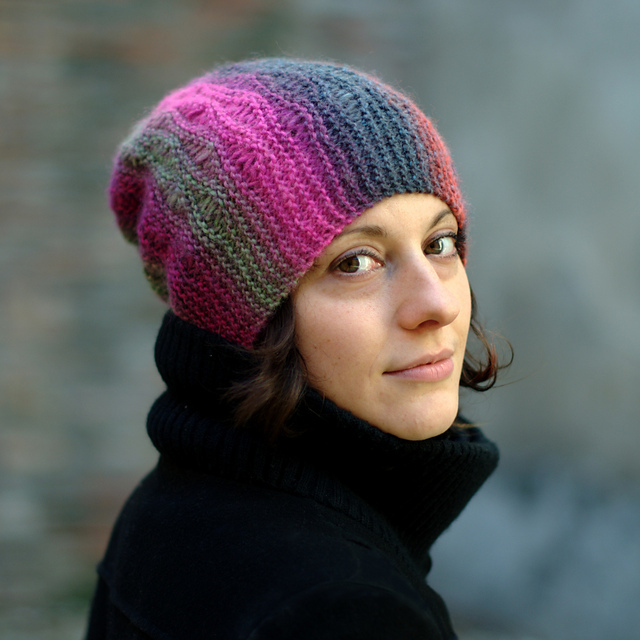 This hat uses the stitch pattern and short rows to full advantage. The dropped stitch pattern opens out and creates a fuller hat but the garter stitch edging keeps the brim snug. Each wedge of the hat is knit with short rows at the crown for shaping and is repeated all the way around to get the size you need. At the very end the provisional cast-on is undone and the stitches are grafted together for a seamless hat. The tutorials on the pattern for both these techniques are just perfect and easy to understand. Of course also being a knitwear designer I had to do my own little tweaking :-) Instead of doing wrap & turn short rows for the crown I added German Short rows and I put a slip stitch edging on the first stitch of the brim. Quite frankly though that was pretty much the only tweaking I wanted to do! And the final hat happily blocking on it’s balloon form. So what Woolly Wormhead pattern are you going to knit next? I am so glad that I have been following Woolly Wormhead’s 10th Anniversary Friends and Colleagues Blog posts. I agree with your accolades about Woolly’s care in writing her patterns. I have never attempted knitting a sideways hat, so one of those designs will be my next hat from Wooly. I have a few Hats on my queue, not sure which I will actually cast on next. Probably Brindled for my mum, tho I also have plans to make Brownie for an expected baby. I love Woolly Wormhead hats, but i haven’t yet knit a sideways one. Must do something about that! I haven’t tried a sideways hat yet but now I’m going to take a look at them. Otherwise I’m planning a yellow Tamya for me to go with my yellow wellies and Alfur for my son. I will make a Concentricity at some point. It looks awesome. I’ve never knit a sideways hat before. Woolly does have some great hat patterns! I’ve enjoyed knitting a number of patterns from Painted Woolly Toppers and I think my next one will be either Lamitra or Dancette, probably the latter as I love the construction.